You are invited to attend a Business Card Brunch with WHA! 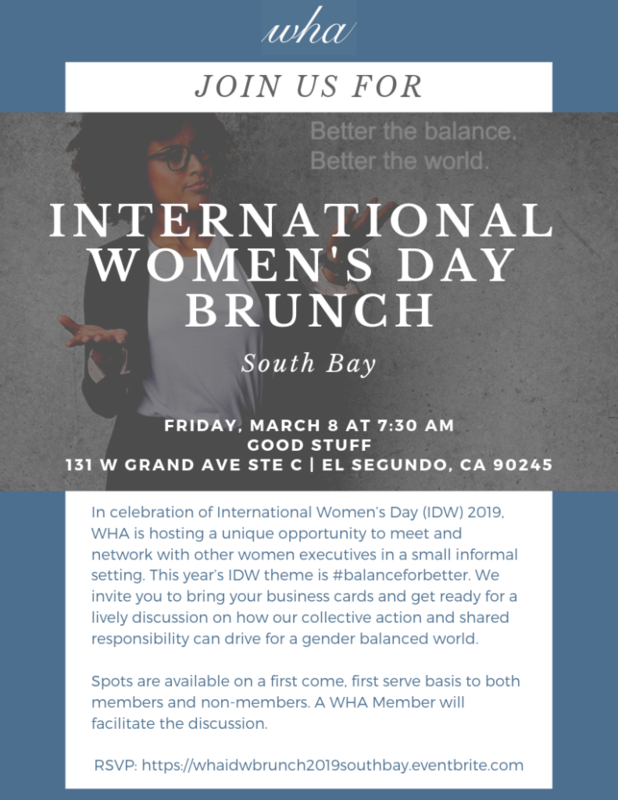 In celebration of International Women’s Day (IDW) 2019, WHA is hosting a unique opportunity to meet and network with other women executives in a small informal setting (less than 10 people). This year’s IDW theme is #balanceforbetter. We invite you to bring your business cards and get ready for a lively discussion on how our collective action and shared responsibility can drive for a gender balanced world. Spots are available on a first come, first serve basis to both members and non-members. A WHA Member will facilitate the discussion. *Please note that these brunches are no-host. Please bring cash to cover the cost of your food and beverages, including tax and tip. We are holding Business Card Brunches in multiple Southern California Geographies — This invitation is for the South Bay event on March 8th. Please check back for the full schedule.